As the excerpt below from a previous “Note” spells out, no one has the right to chemically assault your child in the conduct of a corporate-driven, state-sponsored super vaccination agenda. That is exactly as it is known: Chemical Assault. Just like no one can throw pesticide at you lest they run the risk of being charged similarly. Chemical assault occurs by way of injuring a person with a harmful chemical. When such an assault develops into a death, it’s called manslaughter or negligent homicide. It ought to be called murder because the authorities who administer childhood vaccination programs possess the conclusive scientific data which has proven that death can result in a significant number of extreme reactions to vaccine toxicity. “No entity under the sun has the right or lawful authority to arrogate power unto itself to harm or injure, sicken or infect, paralyze or kill the people of this nation. Not only is such conduct by the state a serious breach of the social contract, it represents a profound violation of the public trust. Vaccination programs therefore break the inviolable bond between the citizenry and the government. Just how serious are we in making these recommendations? Perhaps the young parents ought to read the following two exposés for a good dose of reality. A Pediatrician recently commented on a blog I wrote a few weeks back titled, “Six Reasons to Say NO to Vaccinations”. Her comment got me thinking about how parents could best deal with the tactics that Pediatricians frequently use to compel their patients to vaccinate. Here are a few of the most effective ploys I’ve experienced or heard about at the Pediatrician’s office and how to best thwart them. If you’ve ever been to a Pediatrician’s office with a young child, then you know that Fear is the number one weapon used to coerce parents to vaccinate their children. I’ve had it used on me by a lifelong doctor friend of the family! It takes a major act of will to resist this tactic. Pediatricians deadpan these type of heart stopping questions when parents show any type of resistance to shots and it works very effectively, particularly with first time parents. Once the emotion of fear sets in after hearing these types of terrifying questions, it is so much easier to just allow the doctor to vaccinate your child. Confrontation with a highly educated, sometimes condescending doctor in his/her own office is difficult even for people who don’t shy away from it. No one wants to start an argument in a doctor’s office or walk out with everyone staring at them. The best way to withstand the fear gimmick is to keep thinking about the risk/reward ratio of vaccinating versus not vaccinating. The benefits of not vaccinating far outweigh the risks of vaccinating. Vaccination carries a huge risk of lifelong autoimmune disease for your child. On the other hand, the risk of not vaccinating carries the relatively small risk of infectious disease. Truth is, vaccinating is no guarantee against infectious disease! In an outbreak of mumps last year, 63% of the children who fell ill were completely up to date with their vaccinations! And, if your child is well nourished (if you are reading this blog, he/she probably is), the risk of complications from any type of infectious disease is slim to none. I know this from personal experience. All three of my children had pertussis a few years ago. Any issues or problems? Nada. My youngest was only 15 months old at the time and still had no problems whatsoever. Nourishing children well is a much wiser strategy for long-term health than injecting them with toxins and thinking this will somehow “protect” them particularly when so much evidence abounds that vaccinated children make up the majority of those who get sick in outbreaks. Not only is the risk of catching an infectious disease in the first place quite small, but on top of that you have the even more remote likelihood of complications. On the other hand, vaccinating your children carries the enormous risk of some form of autoimmune or behavior disorder. Don’t believe it? Check out the results of this worldwide survey of over 7,600 unvaccinated children and compare their health with that of the standard population of vaccinated children. Considering that the risk of autism alone is about 1 in 67 right now and increasing rapidly, doesn’t it seem a much more intelligent choice not to vaccinate? Make your own choice for your children based on the observable facts such as what Dr. Eisenstein MD has so aptly done. Not all doctors are condescending. Let me make that point very, very clear upfront. I know there are wonderful doctors out there who listen patiently and respond in a human fashion to the concerns of their patients! However, many Pediatricians are extremely condescending, especially when a parent questions vaccines! I had one doctor once march me down the hall to show me his numerous and impressive university and post graduate degrees beautifully framed on the wall! His point? “I’m smarter and more educated than you are. You are a nobody to be questioning my authority.” My response? I walked out. Don’t let Pediatricians confuse you with their doctor-speak. Doctors are no doubt extremely intelligent people. Intelligence does not equate with common sense, however. The most intelligent people frequently turn out to be the most myopic. A tactic sometimes used by Pediatricians is to tell parents that their child will need shots when he/she goes to school (school officials do this too, by the way). Leading parents to believe that shots are compulsory for school attendance is misleading and deceptive. All states have some sort of philosophical or religious exemption with the exception of Mississippi and West Virginia. I know children all over the USA who attend school, both public and private, who have never had a vaccination. My oldest is now in high school, has attended 5 schools during his educational career and has never had a single shot. If you get this line from your Pediatrician (or school official), put your antennas up immediately. Operation “Manipulate the Parent” is underway. Don’t do a thing until you get home and research the laws of your individual state. This link has a state by state guide to vaccine exemptions. There is almost always a vaccination exemption form that you can fill out to obtain entrance into school sans the shots. A fourth weapon Pediatricians use to cajole parents to vaccinate is the threat that they will be dropped as patients if they don’t comply. I am hearing more and more stories of this type of unethical behavior from Pediatricians – vaccinate your child or else! Even if the parents have a legitimate religious objection to vaccinations, Pediatricians still drop them for refusing shots for their children. If this isn’t against the First Amendment of the Constitution of the United States forbidding discrimination based on religion, I don’t know what is! Doctors can’t refuse a patient due to race, gender, sexual orientation or color – why can they refuse a patient based on religion? Given that many vaccines use aborted fetal cell tissue (where a viable fetus was medically and volunatarily aborted, not miscarried), there is clearly a valid, religious argument for not submitting to these shots. Many religions oppose abortion and using the tissue of a murdered human being to create vaccines is absolutely abhorrent to people of many Faiths. Perhaps a class action attorney reading this blog is looking for a great case. This unjustifiable, unethical, and unlawful behavior by Pediatricians is just begging for a lawsuit! 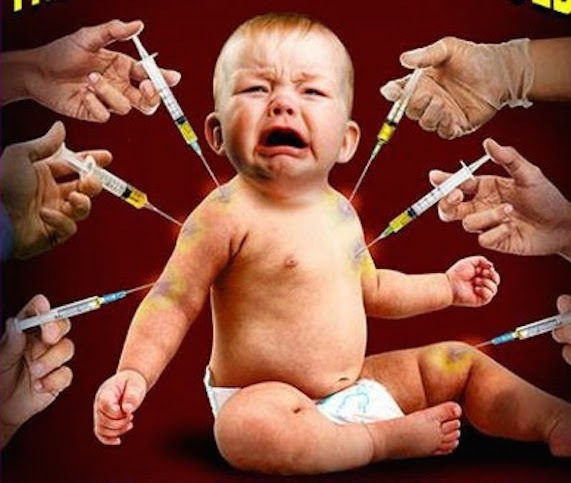 Suing a large Pediatric group such as Pediatric Healthcare Alliance, a group in my metro area (Tampa FL) which espouses dropping patients who do not vaccinate for religious reasons, would stop this egregious practice in its tracks by setting a legal precedent. Ultimately, the best way to resist the pro-vaccination tactics used by Pediatricians is to just not go! Fact: The Pediatric medical specialty was created primarily to administer vaccines to children. Unless you are fortunate enough to have an alternative Pediatric MD in your area, please realize that the typical Pediatrician’s career goal is to have all his/her patients fully vaccinated! Resist vaccination in a Pediatrician’s office and you are going to get read the riot act. Be ready for it if you choose to go. In my experience, Family Doctors are a much better choice as the primary caregiver for children than Pediatricians. Family Doctors are usually much more open minded when parents express misgivings about vaccinations and either want to opt out completely or delay the vaccination schedule for a few years. I have not heard of any Family Docs dropping patients for not vaccinating for religious reasons. There are probably some out there, but it seems to be a much less prevalent practice than with Pediatricians. Family Doctors do not answer to the American Academy of Pediatrics, whose primary purpose is to execute the bidding of Big Pharma and administer vaccines to all children based on the overly rigid and excessive CDC vaccination schedule. This gives Family Doctors a greater degree of freedom in assessing their patients individual needs, not just the assembly line approach to vaccination taken by Pediatricians. This entry was posted in Uncategorized on November 11, 2015 by The Health Coach.